Fifth-gen iPod touch users receive this error updating to iOS 6.1 (via user "_Eric_"
Users began posting in Apple's Support Communities website on Monday following the release of iOS 6.1 to share the problem. Some with the fifth-generation media player have received an error that says the system is "unable to verify update." 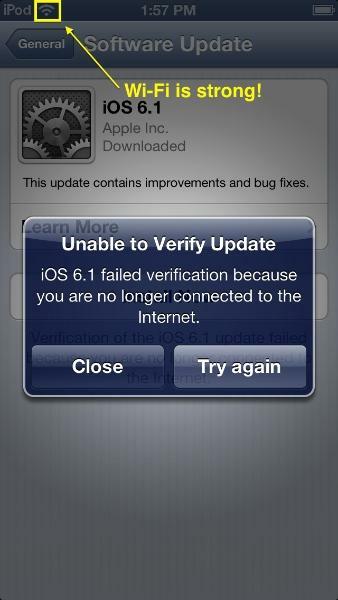 "iOS 6.1 failed verification because you are no longer connected to the Internet," the error reads, even though users are connected to Wi-Fi. The notification gives users the option to close the prompt or try again. Those posting on Apple's support website indicated that the error continues to pop up, even if the iPod is connected to an external power source when the update is initiated. The problem was also apparently a part of the iOS 6.1 beta Apple issued to developers on Saturday. Though that software was not identified as a "golden master" to developers, it ended up being the same update provided to the public on Monday.